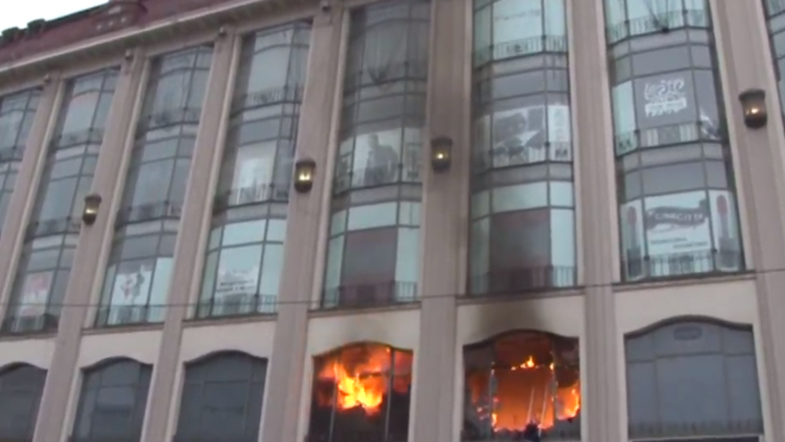 A 5-storey shopping mall caught fire in Lviv. This is reported by the State Emergency Service press office in Lviv region. Shopping center is located on the Shpytalna street. For unknown reasons, the fire began on the first and second floors. Rescuers arrived at the scene. The firemen were able to get to the second floor, from the windows of which fire was visible. In the respiratory protection means, they began to extinguish the flame. The fire destroyed the plasterboard walls on an area of 20 sq.m, a ceiling on an area of 25 sq.m, two windows on an area of 10 sq.m. Goods of the nearby store is partially damaged. No victims reported as a result of the incident. The cause of the fire is being established. Earlier a two-storey house caught fire in Khmelnytsky. While extinguishing the fire, the firemen found a body of 62 years old retired man, as the State emergency service reported on its website. “On March 17, at 2:48 AM a fire station received the message that one flat of the residential house was on fire on the Starokonstiantynivska Street in Khmelnytsky city. The first floor and the roof of the house were on fire when the firemen arrived at the emergency place at 2:52 AM. During the reconnaissance and fire extinguishing processes, the fire rescuers found a deceased 62-year-old citizen of Ukraine,” according to the report.